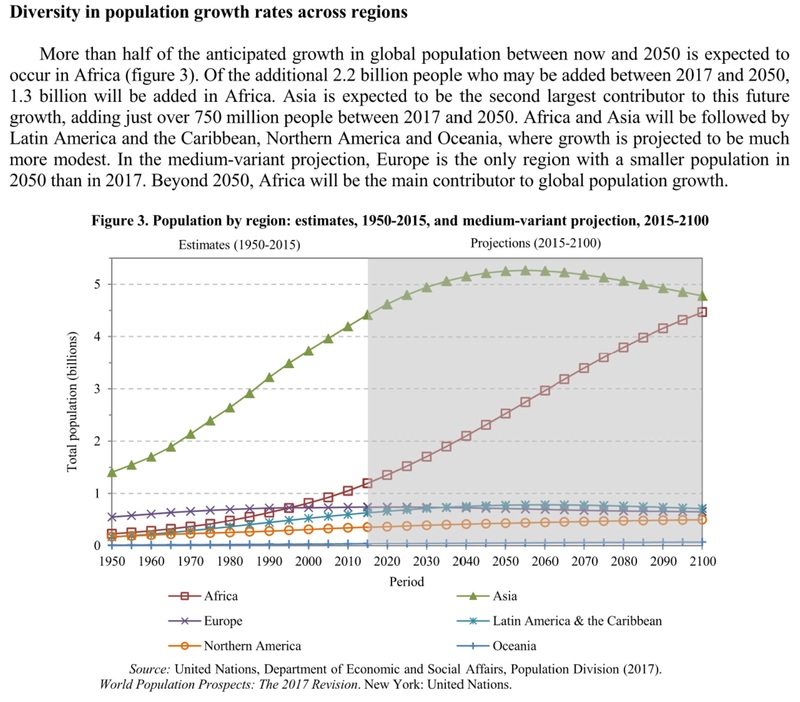 Africa’s population is growing at a much faster rate than the rest of the world. Today, roughly 1 in 7 people in the world are from Africa, the UN predicts that will rise to almost 1 in 2 by 2100. This does not include the growth rate of people of African descent who live in the Americas, Europe, Asia, Australia or Polynesia. In contrast, Europe’s population is projected to fall steadily over the same period, from 742 million to 653 million. After a period of growth, Asia is also expected to shrink, ending up with a population more or less the same as today. People and therefore populations are at the centre of sustainable development and will be influential in the realization of the 2030 Agenda for Sustainable Development. The 2017 Revision of the World Population Prospects is the twenty-fifth round of official United Nations population estimates and projections, which have been prepared since 1951 by the Population Division of the Department of Economic and Social Affairs of the United Nations Secretariat. The 2017 Revision builds on previous revisions by incorporating additional results from the 2010 and 2020 rounds of national population censuses as well as findings from recent specialized sample surveys from around the world. The 2017 Revision provides a comprehensive set of demographic data and indicators to assess population trends at the global, regional and national levels and to calculate many other key indicators commonly used by the United Nations system.